I recently have had the experience to visit the stunning nature of VÃ¤sterbotten in the Lapland of Sweden. Thanks to the relative proximity to the Arctic Circle, June offers 20 hours of daylight. As a photographer, I think this is perfect place to capture the brightness of the midnight sun and watch the perfect magic light shining over the many scenic landscapes VÃ¤sterbotten has to offer. Did I mention Fika yet? Let me take you on a journey through this beautiful part of Sweden. It only takes 2 and a half hours to fly from Amsterdam to SkellefteÃ¥. Small Planet airlines provide a comfortable flight which is operated by GoTONordics. We had clear skies all the way, to arrive in skies with hailstorms. What a stunning sight from above! On arrival, you can straight away feel the fresh air filling your lungs. I also noticed being really tired the first day, probably due to the amount of oxygen in the air. The landscape in this part of Sweden obviously is filled with trees and feels a bit like Canada. While travelling long distances, you might just end up with seeing a reindeer or moose between the trees or even on the road. The reindeers are quite tame and will not run off straight away. A moose in contrast will, since it is much more afraid. We spend our first day together with Mikael Vinka, who is an experienced SÃ¡mi guide and storyteller. He spends most of his time in the outdoors and has incomparable knowledge about the natural landscape and SÃ¡mi culture. He has been walking along the paths of SÃ¡mi history, collecting stories, lore and knowledge. While listening to the stories and hiking on the beautiful peninsula of Bjuroklubb, this is quite a unique experience which brings you even closer to nature. Find out more about the SÃ¡mi culture here. The small lakes you find everywhere have such a calming atmosphere. Another unique place is the tiny island of Pite-RÃ¶nnskÃ¤r, just north of Renholmen outside Byske. Leaving with a small motorised boat from KinnbÃ¤ck, it only takes around twenty minutes to the island. Historically, it is a great fishing location, pilot station and lighthouse station. Today, it is still an idyllic scenery with the horizon as neighbour. A perfect place to relax and watch the time go by. The islandâ€™s skyline is dominated by the lighthouse surrounded by small red cottages, which used to be the homes of the fishermen. Today they are mostly used as summer cottages. It is worth to climb up in the lighthouse, since it provides a great scenic view over the island. The views on top of the lighthouse are amazing, being Swedenâ€™s second highest lighthouse (after 'LÃ¥nge Jan' on Ã–land) and the highest of its type of construction. 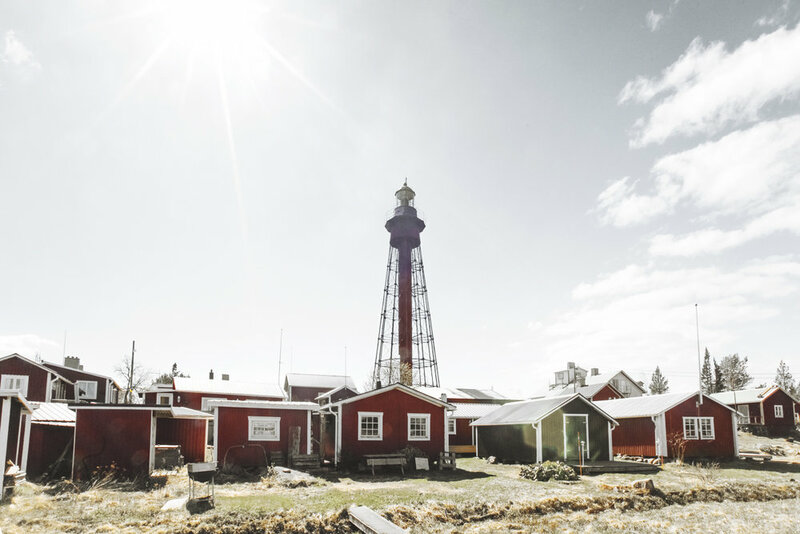 The lighthouse of Pite-RÃ¶nnskÃ¤r dates from 1905 and was deactivated in 1972, as the modern lighthouse NygrÃ¥n (built 1959) placed in open water was enough to provide sea safety. While you are here, it is nice to visit the little fishermenâ€™s chapel. Built in 1771, it used to be a meeting-place for the harbour team. No fisherman was allowed to leave for the herring banks until the chapel bell had sounded. The bell was also used to guide the fishing teams in darkness and fog. When the day ends here, the sun slowly sets to disappear for only three hours. Therefore it doesn't get completely dark, which for me as photographer, is a great opportunity to chase the perfect light all day long! 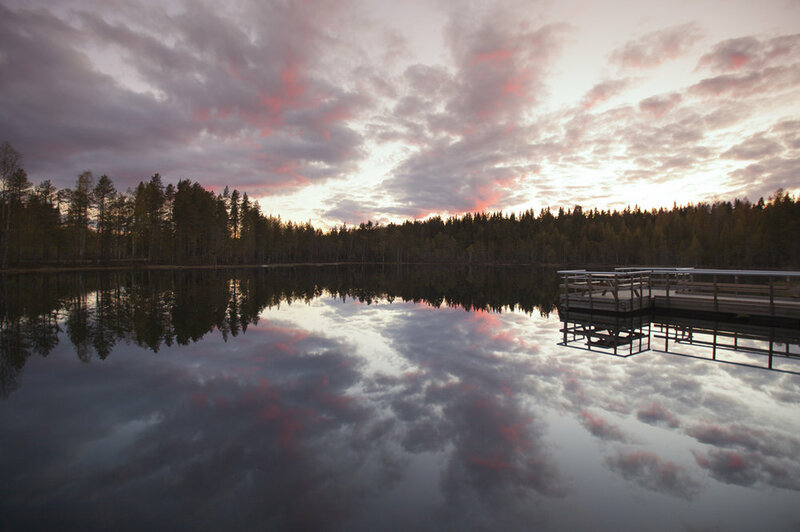 When in SkellefteÃ¥, you should definitely go up to Vitberget to enjoy and capture the stunning views, or relax at the campfire near at a lake nearby to hopefully enjoy a beautiful sunset! Incredible how the light is interesting here, but even more fascinating since this picture was taken around midnight. If you like nature, Sweden is the right place to be for you. With many outdoor activities, even during summer there is enough to experience. Cycling, hiking, rafting, to actually experience the wilderness! In Svansele, we visited The Wilderness Exhibition, which was really unique and educational. It is where they show Swedenâ€™s five largest predators, also know as the Big Five: Lynx, Wolf, Bear, Wolverine and our two big eagle species, the Sea Eagle and Golden Eagle. I would also recommend to take their bicycle tour through the silent nature. There is so much beauty here to see! One of the sceneries during the bicycle tour. Next to their many outdoor activities in this beautiful area, they also offer great wilderness camps where you can spend the night in the middle of the pine tree forests. The food is prepared over open fire and consists mainly off of locally produced meat and vegetables, ranging from Swedish meatballs to reindeer, and moose, served on wooden plates with wooden cutlery. They strive to give an experience as close to nature as possible, which is so nice! Another great thing Sweden has to offer is the many Spa and health traditions. They have been around for some 300 years. As most people are nature lovers, you can understand why they are located in beautiful seclusion in the Swedish countryside and forests. This Hotel is build on a mountain in the shape of an eagle, with a marvellous view over the forests of VÃ¤sterbotten. A perfect place to watch a sunset and sunrise is this tranquil lake in GransjÃ¶n, at just 15 minutes drive from the hotel. I captured the sunset here at 2300 hours. The sun came up only two hours later again. The one thing I like is how all the people are so close to nature here. Something we are not aware of most of the time. Using the elements earth has given us in such a positive way, I think many people could learn from that. This wild river is called the Vindel and is perfect for filling your bottle with water. It was also used for transporting timber and it is great for rafting, fishing and even swimming. Most of all, it is a fantastic hideaway to just watch the forces of nature as the melting icewater from the mountain rages downhill in a tremendous speed. If you like tree houses, you should definitely visit the GranÃ¶ Lodges. This local company is inspired by the areaâ€™s heritage and a local bird watchers devotion to birdlife. Situated at the banks of the river UmeÃ¤lven, youâ€™ll have spectaculair views from the tree houses in where you sleep and feel like a bird! With many activities such as Sami tours, timber rafting, biking, moose safariâ€™s, herbal walks and bread baking, I donâ€™t think you will ever get bored here, as I love sleeping in style! We drove towards our last stop; the lovely city of Umea, where I watched my last sunset from the hotelroom before returning home in the morning. It is a shame this adventure has come to an end. It was such an amazing experience to be so close to nature and to experience and benefit the long midnight sun with itâ€™s fantastic light. One thing is for sure, the friendly people here are living the good life. It made me realise that all the essentials we need are just around you to be found in nature. Something we could truly learn from. This blog is made in collaboration with Visit Sweden, Visit Skelleftea, Visit VÃ¤sterbotten and Gold of Lapland. If you would like to find out more about visiting or traveling to Sweden, then please check here.